It’s not like we never change, it’s something we do almost daily. If there are road works on our way to work, we find an alternative route. If the supermarket moves where it puts our favourite items, we don’t just stand there waiting for them to put them back, we explore, ask around, or choose something different. These are all cIt’s not like we never change, it’s something we do almost daily. If there are road works on our way to work, we find an alternative route. If the supermarket moves where it puts our favourite items, we don’t just stand there waiting for them to put them back, we explore, ask around, or choose something different. These are all change in their own ways. So why, when adapting to shifting circumstances in either a planned or an emergent way, does ‘change’ at work seem so difficult? In organisations there are any number of things that might trip us up when we are leading a co-ordinated change. There may be the politics of agreeing what the problem is, let alone what the solutions might be or there is the challenge of co-ordinating and sustaining effort with people who are all still doing a day job too. There is also the challenge that the goal posts may keep changing as the external environment throws curve balls. And these three examples are just some of the obvious ones! 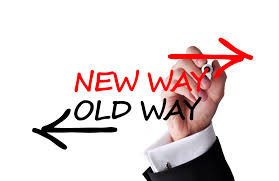 What is often less obvious, is that by simply naming something as ‘a change’, creates a problem. It assumes that change is a ‘thing’, a project to be landed, something with a beginning, middle and an end. Even saying that we know change is constant (all other such phrases) still doesn’t get to the heart of what is going on. The complexity and ambiguity that is inherent in modern organisational life requires leaders to think differently, but also to build their capacity to cope with the discomfort of uncertainty, and to tolerate the discomfort of others with compassion and focused resolve. Not an easy combination. What we are talking about here is ‘Adaptive Leadership’ (Heiftz, 2001), which given the term was originally coined in 2001, isn’t a new idea. The basic premise is that most of the changes organisations struggle with are what Heiftz calls ‘Adaptive problems’, as opposed to ‘Technical problems’. However, most leaders keep focused on trying to find a technical solution (i.e. smarter, better, more adept application of the tools we already have) rather than an Adaptive one. In practice there are often adaptive and technical aspects to most changes, but confusing the two is at best unhelpful, at worst destructive. A typical example might help to illustrate this. Many organisations have an eye on productivity and a lot of change efforts tend to be focused on streamlining systems, removing bureaucracy, incentivising performance and the like. These things may well help and of course should be tried, but the likelihood is that they will only get you so far. As a leader you have to take a wider perspective and see the patterns of behaviour that are getting in the way. If senior leaders are focused on productivity because there is a potential takeover or merger on the horizon, there may well be a huge tension in the workforce between being seen to be productive so bettering an individual’s chances of being retained in a merger, and not wanting the organisation to look too much like an attractive proposition because who knows if we’d keep our jobs anyway? In this type of scenario, a leader’s job is not about keep trying to increase productivity with ever greater technical innovations, but to influence senior colleagues to communicate more with staff about possible outcomes. They must listen to the fears and concerns of staff and coach them to stay focused and resilient, developing a compelling but realistic sense of direction and helping colleagues throughout the organisation feel that they can speak up and contribute to making any change a success.change in their own ways. So why, when adapting to shifting circumstances in either a planned or an emergent way, does ‘change’ at work seem so difficult? In this type of scenario, a leader’s job is not about keep trying to increase productivity with ever greater technical innovations, but to influence senior colleagues to communicate more with staff about possible outcomes. They must listen to the fears and concerns of staff and coach them to stay focused and resilient, developing a compelling but realistic sense of direction and helping colleagues throughout the organisation feel that they can speak up and contribute to making any change a success. Here, we find some honest to goodness and sound advice! Whether you're managing an intern or running an entire business, your employees' success (and your own skin) depends on your leadership. Thankfully, the solution for motivating your team and squashing any issues is right at the tip of your tongue. It all starts with communication -- the skill experts point to as the make-or-break factor for successful leadership. 1. "I have total confidence in you." There's nothing more discouraging than a boss who doesn't believe in a person's abilities and tries to micromanage them at every turn. Even ultra-confident individuals will see their self-belief plummet if they're treated like a white-collar toddler. As President Theodore Roosevelt said, "The best leader is the one who has sense enough to pick good men to do what he wants done, and self-restraint enough to keep from meddling with them while they do it." It might be tough to let go of the reins at first, but if you give your team opportunities to rise to the occasion, you'll find a happier and more motivated office environment. 2. "This is what I want us to accomplish..."
CEO and president of Lockheed Martin Marillyn Hewson found this to be the biggest key to success in her career: "Great leaders motivate and inspire people with why they're doing it," she says. "That's purpose. And that's the key to achieving something truly transformational." What separates exceptional leaders from mediocre bosses is their ability to communicate their plans and tie the daily drudgery into big-picture goals. Charting a clear course for your team fosters a sense of job stability and drive at work -- so always take the time to explain "why" instead of merely doling out orders. 3. "What can we do better next time?" As Arianna Huffington sagely suggests, mistakes are the best teachers. "We need to accept that we won't always make the right decisions, that we'll screw up royally sometimes," she says. "Understanding that failure is not the opposite of success, it's part of success." Every person on planet Earth has messed up at his or her job at least once (even me...well, maybe more than once). Mistakes happen, especially when you're trying something new. As long as it's not a reckless or careless mistake, turn that error into a learning experience. Teaching someone what to do next time to avoid a blunder is much more productive than reprimanding them. 4. "I want to play to your strengths." Warren Bennis, a renowned author and scholar on leadership, found that "Too many companies believe people are interchangeable. Truly gifted people never are. They have unique talents." He says, "Such people cannot be forced into roles they are not suited for, nor should they be. Effective leaders allow great people to do the work they were born to do." Every person on your team has special skills -- that's why I embrace uniqueness at my company, and you should, too. This speaks to the idea of treating people as individuals in a world where employees are too often seen as expendable. Looking for greatness in everyone we work with can only lead to great things. 5. "What is your opinion?" Top-notch bosses don't let ego get in the way of innovation -- they seek advice from everyone, regardless of where they are on the totem pole. Asking your employees what they think is another great way to show that you have faith in them and value their input. Plus, I've found that the best insights come from the most unexpected places. 6. "How can I better support you?" An excellent way of reducing employee turnover is a preventative approach. Take the time to check in with your team. Ask them what's on their plate and what you can do to help them succeed. As Sheryl Sandberg, the COO of Facebook, says, "Leadership is about making others better as a result of your presence and making sure that impact lasts in your absence." If you serve and enable your team, they'll want to do the same for you and your company, too. 7. "Let me know if you have any questions." Many people have had at least one intimidating boss whom they didn't feel like they could go to for help. Having an open door policy shows that you're available to your team and care about open communication and their productivity. The faster their questions are answered, the faster they can get back to accomplishing the task at hand. Giving recognition is a lot cheaper than installing Ping-Pong tables or nap pods, and much more effective. No matter how much employees are paid and how cushy their perks are, they'll want to know that someone cares about their work. So take a few minutes to invest in well-deserved praise -- your team will always appreciate it. Poll: Do you think Ireland is overly dependent on foreign investment for jobs? Poll: Do you think Ireland is overly dependent on foreign investment for jobs? Some say the country’s track record with overseas firms is ‘enviable’.